A.S. ASSOCIATED ENGINEERING (1964) CO., LTD.
On the 11th of January 2019 Representatives of A.S. Associated Engineering (1964) Co. Ltd., give gifts and provide ice cream treat for Children’s Day 2019 at Anuban Pak Tho School, Ratchaburi Province. On December 01, 2018, STEC-AS-4 JV, organized the Basic Fire Fighting Training : Annual Fire Fighting and Emergency Evacuation Drill for 2018 at site office, Soi Phaholyothin 63, Bangkok, for “THE MRT GREEN LINE (NORTH) PROJECT MO CHIT – SAPHAN MAI – KHU KHOT SECTION CONTRACT 4 : TRACKWORK” of Mass Rapid Transit Authority of Thailand. 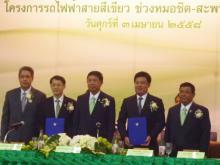 Participates in Krathin Festival to raise fund for the Sermon Hall and Crematorium restoration at Wat Nong Bue. On 27th October 2018, Mr. Aungsurus Areekul , Chairman of A.S. Associated Engineering (1964) Co., Ltd., participates in Krathin Festival to raise fund for the Sermon Hall and Crematorium restoration at Wat Nong Bue, Tambon Nong Haen, Amphoe Phanom Sarakham, Chachoengsao Province. 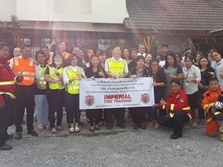 On the 25th of October 2018, A.S. Associated Engineering (1964) Co., Ltd., organized the Basic Fire Fighting Training : Annual Fire Fighting and Emergency Evacuation Drill for 2018 at its Headquarter in Soi Yasoob 1, Vibhavadi – Rangsit Rd., Jomphol Jatujak, Bangkok. A.S. Associated Engineering (1964) Co., Ltd. joined the INTERMAT ASEAN 2018 Trade Show at IMPACT Arena, Muang Thong Thani. On 6th September, 2018, Mr.Aungsurus Areekul, Mr.Danuch Yontararak, Executive Director of A.S. Associated Engineering (1964) Co., Ltd. visited the company booth at the INTERMAT ASEAN 2018 which is the platform for the Southeast Asian Trade Show for Construction and Infrastructure during September 6-8, 2018 at IMPACT Arena, Exhibition and Convention Center, Muang Thong Thani, Nonthaburi, THAILAND. 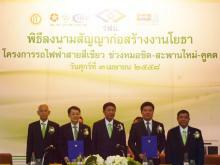 Mr. Aungsurus Areekul, President of the Thai Contractors Association Under H.M. The King’s Patronage, visited the INTERMAT ASEAN 2018. On 6th September, 2018, Mr.Aungsurus Areekul, Chairman of A.S. Associated Engineering (1964) Co., Ltd., who is the President of the Thai Contractors Association Under H.M. The King’s Patronage joined the INTERMAT ASEAN 2018 which is the platform for the Southeast Asian Trade Show for Construction and Infrastructure during September 6-8, 2018 at IMPACT Arena, Exhibition and Convention Center, Muang Thong Thani, Nonthaburi, THAILAND. On the 16th of July 2018 which Commemorates the 54th Anniversary of the founding of A.S. Associated Engineering (1964) Co.,Ltd., merit making event and offering alms to monks was arranged at its Headquarter in Soi Yasoob 1, Vibhavadi – Rangsit Rd., Jomphol Jatujak, Bangkok. Construction Site Visit of the Green Line (North) Project: MO CHIT – SAPHAN MAI - KHU KHOT SECTION by the Executive Director of A.S. Associated Engineering (1964) Co., Ltd.
On 10th May 2018, Mr.Aungsurus Areekul, Mr.Danuch Yontararak, Mr.Chettha Phatidumrongkul, Executive Director of A.S. Associated Engineering (1964) Co., Ltd. and his entourage visited the construction of Green Line (North) Project: MO CHIT – SAPHAN MAI - KHU KHOT SECTION, Contract 4 : Trackwork. 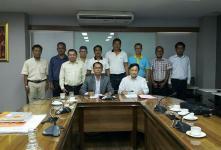 The team was welcomed by Mr. Patipat Poka and Mr.Chaiake Pruanpitak. A brief overview presentation of project progression was given to the Executive Director prior to construction-site visits. Year Awards 2018 Compliment Award Certificate from MRTA for Occupational Health, Safety and Working Environment management and Safety Officer in Construction of Rapid Transit System. On 4th May 2018, Mr. Patipat Poka, the representative of STEC-AS-4 Joint Venture for MRT Green Line (North) Project: MO CHIT – SAPHAN MAI - KHU KHOT SECTION, Contract 4: Trackwork, has received the “ Year Awards 2018 Compliment Award Certificate” for Occupational Health, Safety and Working Environment Management in Construction of Rapid Transit System, while Mr. Weerasak Saranthamakul, has received the “Year Awards 2018 Compliment Award Certificate” for Safety Officer in Construction of Rapid Transit System from Mass Rapid Transit Authority of Thailand (MRTA). 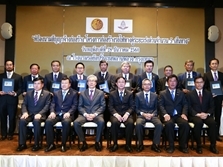 Appointed Chairman of A.S. Associated Engineering (1964) Co. Ltd., to be the President of the Thai Contractors Association Under H.M. The King’s Patronage (TCA) for the period of 2018 to 2020. On 19th April 2018, Mr.Aungsurus Areekul, Chairman of A.S. Associated Engineering (1964) Co. Ltd., was appointed to be the President of the Thai Contractors Association Under H.M. The King’s Patronage (TCA) for the period of 2018 to 2020. And jointly signed handover document from the former President, Mr. Sangworn Liptapanlop, at TCA Office, 3rd Floor Oriental Residence, Wireless Road, Bangkok. On 28th December 2017, Mr.Aungsurus Areekul, Managing Director of A.S. Associated Engineering (1964) Co.,Ltd., jointly signed contract for the Track Doubling Project, Nakhon Pathom – Hua Hin Section, Contract 1 : Nakhon Pathom – Nong Pla Lai Section Amount 8,198,000,000 Baht with the State Railway of Thailand. 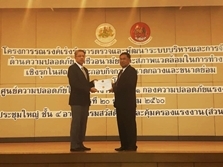 On 20th December 2017, the representative of A.S. Associated Engineering (1964) Co.,Ltd.,Mr.Danuch Yontararak Director and Deputy Managing Director, received the Certificate of Achievement for Good Practice in Occupational Safety and Health Management “Gold Award” by Department of Labour Protection and Welfare. On the 1st of September 2017, A.S. Associated Engineering (1964) Co., Ltd., organized the Basic Fire Fighting Training : Annual Fire Fighting and Emergency Evacuation Drill for 2017 at its Headquarter in Soi Yasoob 1, Vibhavadi – Rangsit Rd., Jomphol Jatujak, Bangkok. On the 15th of July 2017 which Commemorates the 53rd Anniversary of the founding of A.S. Associated Engineering (1964) Co.,Ltd., merit making event and offering alms to monks was arranged at its Headquarter in Soi Yasoob 1, Vibhavadi – Rangsit Rd., Jomphol Jatujak, Bangkok. 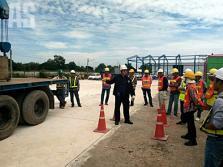 Safety Training : For force crane tower, car crane and ship crane etc. On November 1 – 4, 2016 : A.S. Associated Engineering (1964) Co., Ltd., organized the Safety Training on Theories for operators of force crane tower, car crane and ship crane on November 1-3, 2016 at site office, Soi Phaholyothin 63, and practical workshop on November 4, 2016 at warehouse, Romklao Rd., for “THE MRT GREEN LINE (NORTH) PROJECT MO CHIT – SAPHAN MAI – KHU KHOT SECTION CONTRACT 4 : TRACKWORK” of Mass Rapid Transit Authority of Thailand. On September 19 - 23, 2016, STEC-A.S. 4 Joint Venture’s Representative, Consultant and MRTA Officer visited to Precast Factory for Rail Production in AUSTRIA, “THE MRT GREEN LINE (NORTH) PROJECT MO CHIT - SAPHAN MAI - KHU KHOT SECTION CONTRACT 4 : TRACKWORK” of Mass Rapid Transit Authority of Thailand. On September 12 – 16, 2016, STEC-A.S. 4 Joint Venture’s representatives, consultants and MRTA officers visited precast factory for rail fastening production at Bonemill La Workshop, Sheffield S81 7AX, UK for “THE MRT GREEN LINE (NORTH) PROJECT MO CHIT – SAPHAN MAI – KHU KHOT SECTION CONTRACT 4 : TRACKWORK” of Mass Rapid Transit Authority of Thailand. On July 20 – 21, 2016, A.S. Associated Engineering (1964) Co., Ltd., organized the Basic Fire Fighting Training : Annual Fire Fighting and Emergency Evacuation Drill for 2016 at its Headquarter in Soi Yasoob 1, Vibhavadi – Rangsit Rd., Jomphol Jatujak, Bangkok. On the 15th of July 2016 which Commemorates the 52nd Anniversary of the founding of A.S. Associated Engineering (1964) Co.,Ltd., merit making event and offering alms to monks was arranged at its Headquarter in Soi Yasoob 1, Vibhavadi – Rangsit Rd., Jomphol Jatujak, Bangkok. On 13th May 2016, Mass Rapid Transit Authority of Thailand (MRTA) , organized the 2016 Annual Occupational Health and Safety activities, which STEC-AS-4 JV was invited to jointly lecture on the topic of “Safety for Trackwork Installation for MRTA” at MRTA’s building, meeting room No.2 on the 9th floor. On the 28th of April 2016, A.S. Associated Engineering (1964) Co.,Ltd. Organized event of merit making and offering alms to monks at A.S.’s site office for MRT Green Line (North) Project, Mo Chit – Saphan Mai – Khu Khot Section (Contract 4 : Trackwork) in Soi Phahonyothin 63, Phahonyothin Rd., Bangkhen, Bangkok. On 24th April 2016, Mr. Chettha Phatidumrongkul , Director and Deputy Managing Director of A.S. Associated Engineering (1964) Co., Ltd., jointly signed contracts for the “Construction of Highway Route No.408 Nakhon Si Thammarat - A.Sathing Phra (Part 4), between Km.70+200.000 – Km.82+000.00 , total distance 11.80 Km. long” and for the “Construction of Highway Route No.408 Na Thawi – Dan Prakob, between Km.235+459.000 – Km.251+425.000, total distance 15.966 Km. long” commissioned by the Department of Highways. Jointly offered robes to Buddhist monks at the monastery of Wat Huay Moo as partial funding for the construction of the school building for autistic children at Wat Huay Moo School. On 26th February 2016, Mr. Aungsurus Areekul , Managing Director of A.S. Associated Engineering (1964) Co., Ltd., jointly offered robes to Buddhist monks at the monastery of Wat Huay Moo Tambon Chedi Hak , Amphoe Meuang, Ratchaburi Province as partial funding for the construction of the school building for autistic children at Wat Huay Moo School. 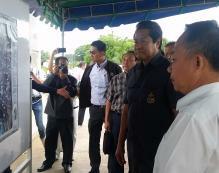 On 17th July 2015, His Majesty’s Most Honorable Privy Councillor Palakorn Suwannarat and his entourage visited the construction of Chanthaburi Flood Alleviation Project (Phase 2) and was welcomed by The Honorable Samart Loyfah, Governor of Chanthaburi, and related government agencies. A presentation was given by the Governor's teams on the overview and progress of the project, prior to actual site visits by the Privy Councillor and his entourage. On the 15th of July 2015 which Commemorates the 51st Anniversary of the founding of A.S. Associated Engineering (1964) Co.,Ltd., merit making event and offering alms to monks was arranged at its Headquarter in Soi Yasoob 1, Vibhavadi – Rangsit Rd., Jomphol Jatujak, Bangkok. April 29, 2015: Representatives of A.S. Associated Engineering (1964) Co., Ltd. jointly contributed to the “From Heart of the Thai People to Nepal” Project to aid victims of the recent earthquake in Nepal; pictured here, the contribution is being accepted by M.L.Panadda Diskul, Minister Attached to the Prime Minister’s Office and Permanent Secretary, Prime Minister’s Office. On 3rd April 2015, Mr. Aungsurus Areekul, Managing Director, and Mr. Danuch Yontararak, Deputy Managing Director, of A.S. Associated Engineering (1964) Co., Ltd., jointly signed “Construction of the MRT Green Line (North) Project, Mo Chit – Saphan Mai – Khu Khot Section, Contract 4 : Trackwork” of Mass Rapid Transit Authority of Thailand. On 3rd April 2015, Mr. Aungsurus Areekul , Managing Director of A.S. Associated Engineering (1964) Co., Ltd., jointly signed “Construction of the MRT Green Line (North) Project, Mo Chit – Saphan Mai – Khu Khot Section, Contract 3 : Civil Works, Depot and Park & Ride Facilities” of Mass Rapid Transit Authority of Thailand. 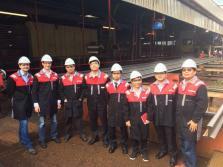 On December 09, 2014 Mr. Aungsurus Areekul Managing Director of A.S. Associated Engineering (1964) Co.,Ltd. pray his respect to His Majesty The King at Siriraj Hospital. Long Live The King! A.S. Associated Engineering (1964) Co., Ltd. organized golfing for harmony to commemorate the company’s 50th Anniversary under the event’s banner “50 Years ASAE: Golfing for Harmony and Friendship” on August 1st, 2014 at Riverdale Golf Course and Country Club, Patumthani Province. A.S. Associated Engineering (1964) Co., Ltd. had been in business for 50 years. On the 15th of July, 2014, the company organized a merit making at the head office in Soi Yasoob 1, Vibhavadi-Rangsit Road, and the lunched with staffs at T-House Restaurant on Vibhavadi-Rangsit Road. 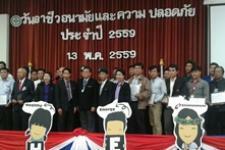 Copyright© 2014 A.S. ASSOCIATED ENGINEERING (1964) CO., LTD. All Right Reserved.